My friend Birdie, my birding guide, instructor, encourager, took me to 3 great birding locations in SE Arizona. The first was Ramsey Canyon...my favorite for hiking so far. Not a lot of birds, but did see a new one for me. First bird was an Acorn Woodpecker. Birdie would call this a "Lifer" for me. You can see they've been busy here. They eat mainly acorns and store them in holes they drill. Don't remember what this is. This grand old tree is called an Alligator Juniper. So named because of its alligator skin-like bark. Gorgeous views of the canyon walls. The James House was built by John James in 1911. From the 1880s to the late 1920s, Ramsey Canyon was home to almost 100 settlers. Tree rings in this Arizona Sycamore date it to about 1760! The hiking trail to an overlook. The sign says we have entered the "wilderness" of the Coronado National Forest. Imagine the forces that created this wavy pattern in the cliffs. This was the first James cabin built in 1902, before the other house was built. Its more recent residents include Ring-tailed Coati, lizards, and bats. Sorry I didn't see any of those. This gray squirrel did stop to pose for me though. And so did this young deer. Our next birding venture took us to San Pedro Riparian Natural Conservation Area. Riparian means "along a body of water," in this case the San Pedro River. The Boquillas Land and Cattle Co. built the San Pedro House in the 1930s for their ranch manager. The cottonwood tree behind the house was planted in 1948. Bird feeders are located around the house. This one has a Pyrrhuloxia and finches. Lots of sparrows at the feeders. The trail crosses this field to the river where you see the line of trees. Where we found a pair of Mexican Mallards. Most birds did this just as I was trying to focus. Green Kingfisher Pond was once a sand and gravel quarry. We didn't see any Green Kingfishers which is too bad because it would have been a new one to me. We did see ducks and Coots. 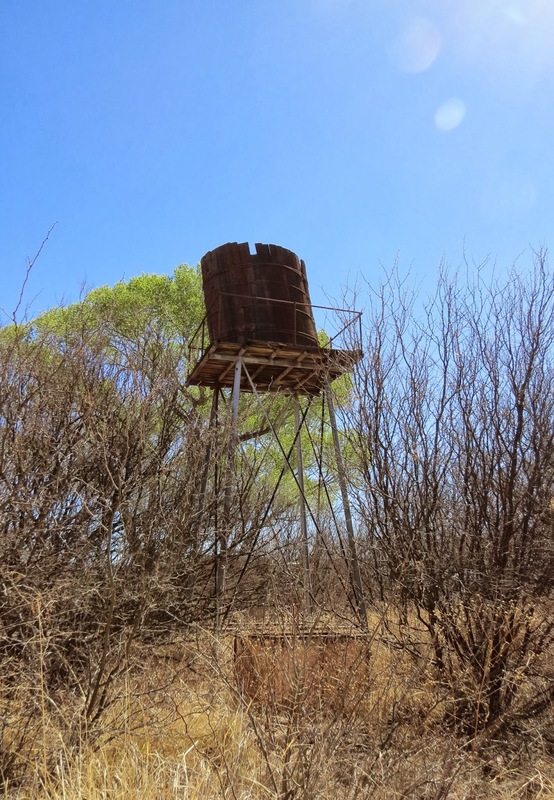 The old wooden water tower was part of the original ranch structures. The cabin built of railroad ties was a playhouse for children of the ranch hands. This large Fremont Cottonwood is estimated to be about 120 years old and measures 36 feet around. Whitewater Draw was our next birding location, and my favorite so far. This American Kestrel greeted us as we arrived. Dry camping is allowed here in the parking area. This is a Great-horned Owl in a nesting box in the eaves of a shelter. Northern Shoveler among some American Avocets. The Avocets were new to me. The Snow Geese have landed near the Sandhill Cranes. More Sandhill Cranes flying in. As we were leaving the Great Horned Owl peeked at us over the edge of the nesting box. Going birding again tomorrow in a different place, so will have more birds later in another post. Looks like you saw lots of birds at the last place. I loved the woodpecker pics at the beginning. Amazing that they put so many holes in the tree and I never realized that they stored nuts in them.